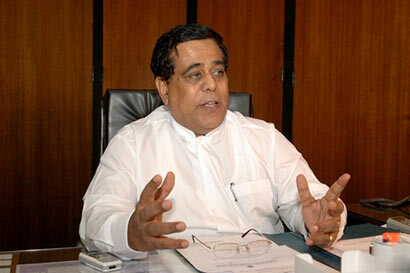 Leader of the Opposition Nimal Siripala de Silva said yesterday that Ranil Wickremesinghe became the Prime Minister due to the benevolence of President Maithripala Sirisena as it is impossible for a party that does not command the majority support in Parliament to appoint its leader as the Prime Minister. He said this in response to a statement made by the Prime Minister in Nupe, Matara. In response, de Silva said Wickremesinghe has no right to occupy the office of the Prime Minister and that he lacks ethic. He added that in such a backdrop it was ridiculous that the Prime Minister was making such allegations. He added that the Prime Minister has ridiculed the judiciary by criticizing the Supreme Court decision with regard to former Defence Secretary Gotabaya Rajapaksa’ Fundamental Rights application. De Silva also stated that the President has ensured independence of the judiciary, whilst the Prime minister who preaches about good governance is ridiculing it. De Silva further stated that he is actively engaged with the President in promoting good governance, however, he does not support the Prime Minister who displays the exact opposite through his actions. He added that the Financial Crimes Investigation Division (FCID) that comes under the purview of the Prime Minister is politicized and that he used political influence to clear the Central Bank Governor with regard to Treasury Bonds fraud. It took you so long as the leader of opposition to realize, something ordinary folk had seen from the day one? Check Internet forums if you don’t believe me. What you and the rest who supported the new Saviour of SR is to allow use the SLFP for political revenge and humiliation of MR and his supporters and return the country to be another ‘stooge’ of yankees. How are the development projects are going now? How is the development of the country now after the election? The Leader of the Opposition is absolutely correct. Hon Wickremasinghe has no constitutional or other right to be in the PM’s chair. He was appointed PM because he fostered by a backbone-less antiquated politician to the mighty chair so that he could manipulate the weakling to his advantage. He then goes to strangle the opposition in JRJ fashion, having created the FCID and subjecting the Rajapaksa family to wild allegations and spurious misconduct. When he saw the judiciary responding to FR petitions in real legal traditions, he resorts to screwing Justice SriPavam and his team. Watch out, CJ Sri Pavam is from the wrong end of the island and his allegiance is most likely to the red flag with crosses on it and not the red flag with stripes. Hon Wickremasinghe’s mate, Mahendram, cannot understand why the PM is going to extremes to protect this guy. He is just another banker, a dud banker too. After all, what RW’s Government has done in the past 4 months in economic terms, is disastrous. Prior to his elevation to the PM’s chair Hon Wickremasinghe had some status within the elite and learned communities as a leader of substance. With the disastrous performance protecting stupid Mahendram, Hon Wickremasinghe has lost that status amongst the learned and rich. Ranil`s main ambition is to break the SLFP and then get the breakaways on his side. Thank god Siripala has realized it, it is not too late. Act now. Yes ranil doesn’t have real mendate but of course these slfp the most corrupt members having these.